Caol Ila 17 Years Old 1997 Unpeated is a quite mellow whisky, quite balanced, intense, with expressive fruity scents and chocolatey notes. 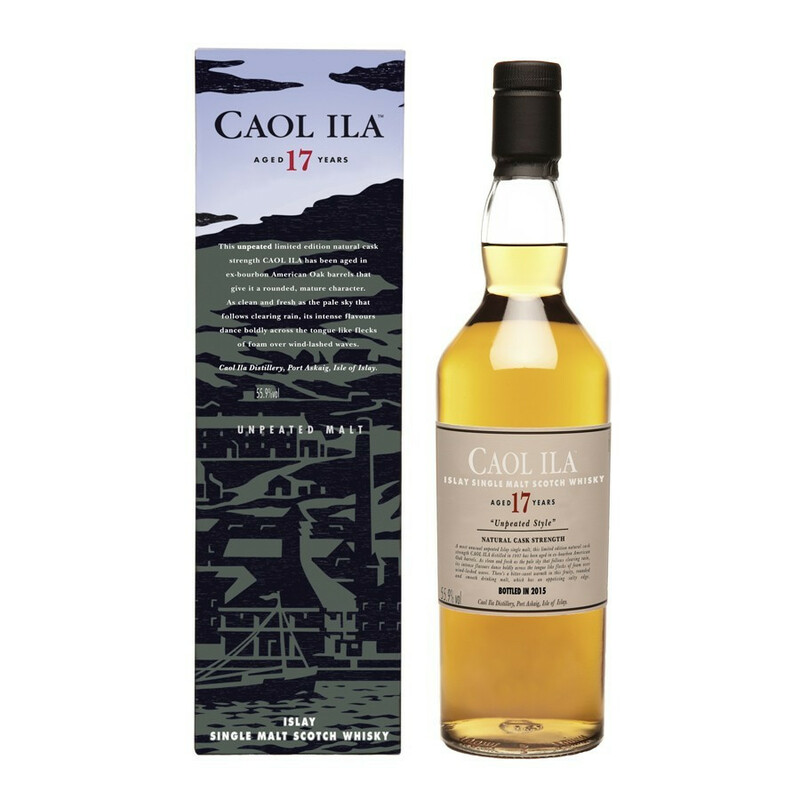 This Caol Ila 17 Years Old Single Malt is an exceptional, unpeated edition! Caol Ila previously bottled famous unpeated editions such as an 8 year-old malt, but this is a quite unusual process for this Islay distillery. This edition has been distilled in 1997 and bottled in 2015, and is almost impossible to find these days. The qualities of this Single Malt have been long recognised by the discerning palates. Its name is to be pronounced “Caool-Ila” and means “Islay Strait” in Gaelic. The distillery sits in a cove near Port Askaig, where playing seals are a common sight. The buildings host three wash stills and three spirit stills. The production reaches 3.6 million liters of alcohol a year. Behind the distillery, stands a beautiful hill covered with fuchsia, foxgloves and dog rose, up to the peaty loch on the top where the mineral and salty stream runs, as it passed through limestone. Built in 1846 and rebuilt in 1879, the distillery has experienced a complete makeover in the 1970’s. Reminiscent of smoky malted barley, Caol Ila is also maritime, vegetal, oily and peaty. The latest official releases are extremely characterful, with an intense peaty and smoky character with an amazing bittersweet balance. The unique character of Caol Ila ranks the distillery in the Classic Malts Selection. Created more than 20 years ago, this selection recognises Single Malts crafted in the tradition of iconic distilleries, and offers the most impressive whisky styles Scotland has to offer. Nose: understated, fruity, evolving onto sweet, intense flavours. A quite balanced profile, lightly smoky, fresh with dry notes in the background: moss, bread. A trail of water reveals a crisp sensation with flavours of fruitcake, woodfire smoke, salt, caramel, honey and lemon. Palate: intense, with a deep flavour of candied fruits, chocolate, ginger, with a warm, salty, bittersweet zing. Water brings forward sweeter notes of salt, minerals and peppery flavours. A clean, tanned and sweet texture. Finale: medium to long, warm and wrapped in dark chocolate notes, a bittersweet flavour with a slightly smoky, salty background. A refreshing, peppery finish.